Today was the first day of my new class. We’re calling it The Lottery. The “we” for this cycle is me and my co-teacher, who is awesome. We’ve talked a lot about the class and it is challenging me and my regular routine, and it’s leading to great results so far. My typical probability class is serving as the frame for this class, and we are modifying it. Heavily. It’ll probably be a whole different experience by the time we get finished. We’re calling it the lottery to tap into some of the kids natural curiosity about something around them, as opposed to my previous class which centered around a make-believe carnival. Today we began class with another number talk, and then we did four corners about the lottery. 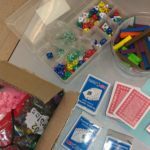 Dice, Playing Cards, Cuisenaire rods, and all the random stuff we brought in so kids could make their games. Next we decided we came up with this thing called “Games of Chance”. We wanted kids to work hands-on with a task that put them in the driver’s seat. This task asked them to work in small groups to make up games that other kids could play. They made up the rules of the game, the price to play the game, as well as the prize that winners could take home. To help make the tangible game we gather a pile of useful things (Dice, cubes, playing cards, etc). The kids came up with an array of interesting games. One was flip over one of twelve cards, another involved rolling a dice, and then drawing a card from a deck of cards over and over until you got the amount on the dice. At the end of co-teacher’s 15 minute timer, groups paired up and played each others games. Students were deeply engaged in the activity, as I orbited around the edge of the room. We had enough time for 3 different games to be exchanged before we stopped and got into a circle to talk about the games that everyone played. Hopefully we wanted to see if students were having the kinds of headaches that the mathematics in my class could serve as the aspirin. My favorite comment was from a student who seemed visibly frustrated. “We made a game that was basically impossible,” said the student, annoyed by the game that their group settled on, “It’s so hard, no one’s ever going to win!! !” This sounds exactly like the kind of thinking that people should be embarking upon for a class called “The Lottery,” don’t you think?